Personal blenders have become very popular in recent years, and for good reason. The idea of having a healthy smoothie to go in a couple of minutes with minimal cleanup is very appealing, and a good personal blender can do just that. There are a few things we look for in personal blenders that can make the difference between something that would be used every morning and something that is only used a few times and discarded. The first factor is power. While manufacturers love to throw around claims of watts and horsepower with different appliances, in the case of a blender power is critical. The difference between a 200-watt model and a 900-watt model is apparent in both the speed of blending and the smoothness of the result. The second factor is jar size. A good personal blender should have a jar that can hold at least 500 milliliters. Even if you don’t want to make a large smoothie, the extra space will help the vortex effect and result in a better-blended smoothie. In addition, larger jars usually have wider openings. It is much easier putting ingredients into 10 cm opening versus a 6 cm opening, especially things like spinach leaves or protein powder. Cleaning is also an important consideration. A hard-to-clean appliance becomes an unused appliance. A good personal blender should have an easily-cleaned blade assembly, and being dishwasher safe is a big bonus. Finally, price is something to keep in mind. We’ve seen personal blenders for less than 30 euros all the way up to the 500 euro Vitamix S30 hybrid. While styling is subjective, the design should be functional. You can find everything from cheaply made personal blenders in crazy neon plastics to the Vitamix S-30’s chunky industrial look. 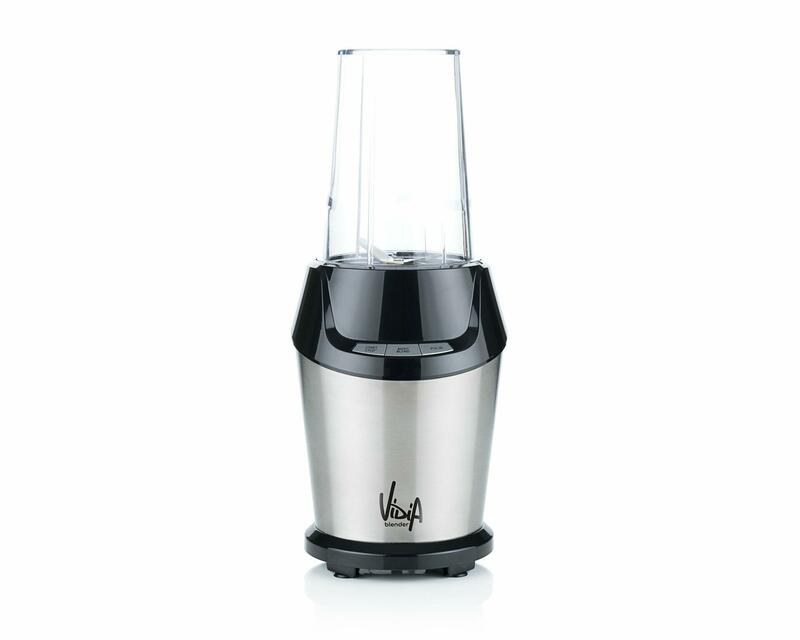 The Vidia Personal Blender plays it safe, featuring a stainless steel body with black plastic accents. It feels sturdy and well-built, and has four rubber suction feet to firmly hold it on a smooth surface. The controls are simple: three touch buttons on a flat horizontal panel labelled START/STOP, AUTO BLEND, and PULSE. The horizontal panel was nice, as it means the control panel is flat and the buttons are facing up toward the user. 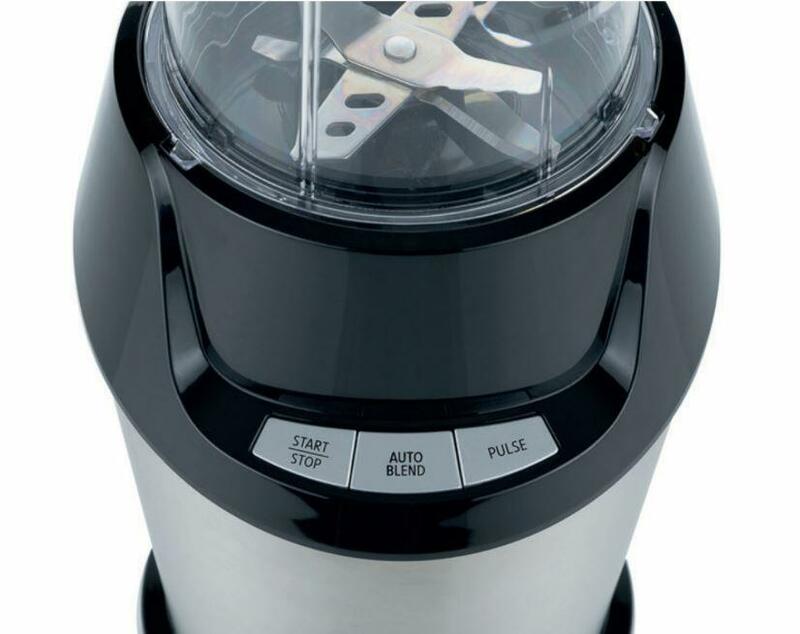 In fact, many personal blenders have no controls at all, instead requiring you to twist or hold down the blending jar to operate. The Vidia is much easier as you can be doing something else while it blends. It comes with three jars in 700ml, 500 ml, and a 350ml to-go cup. All the jars had a nice 10-cm width, which made adding ingredients and cleanup very easy. The top of the jar is wide as well, which makes blending easier but you’ll need a large cupholder in your car if you plan to be drinking on the go. Fortunately it comes with two screw-on lids plus a to-go lid with a sealable flip top to drink from. The jars are made from BPA-free Tritan material, which has the advantage of being dishwasher safe. Maybe the best reason for getting a personal blender is ease of use. While big countertop blenders will offer far more power and performance, the advantage of a personal blender is speed, convenience, and easy cleanup. The Vidia PBL-001 excelled in all these areas. The wide mouth jar made it easy to feed ingredients, the AUTO BLEND program let us make smoothies with one touch in less than a minute, and the wide base with stainless steel blades rinsed clean in just a few seconds.It took about 4 minutes from opening the fridge for ingredients to leaving the house with a smoothie. It might sound trivial, but being able to put the jars into the dishwasher was a time saver. 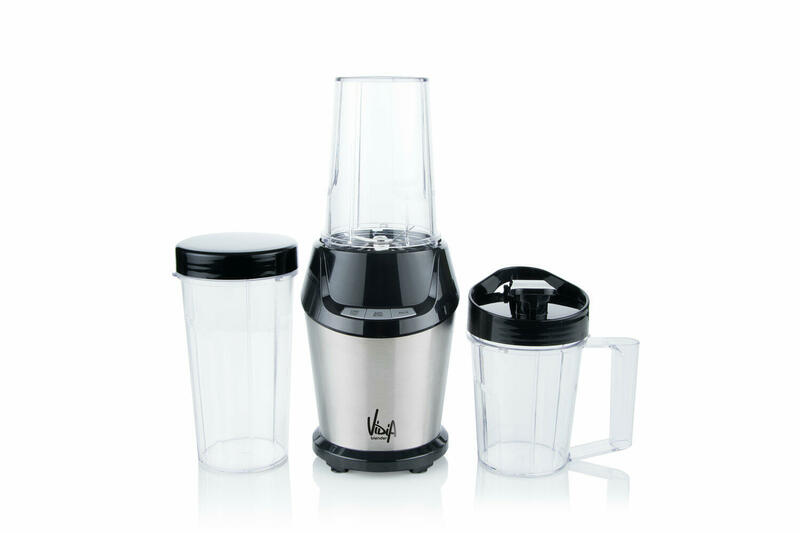 It is really convenient that the blending jar becomes the drinking cup, saving the step of pouring the smoothie into a second glass or cup and having to immediately wash the blending jar. The to-go cup has a nice handle, but we found ourselves using the bigger 500ml and 700ml jars more often as blending is easier in them. The Vidia excelled here, especially considering the price. But that’s to be expected, given that it packs a 1000-watt motor. Compared to the some personal blenders with less than 300-watt motors, or even the Vitamix S-30 with 790 watts, the Vidia is a mini beast in blending. We tried our daily smoothie recipe – spinach, frozen strawberries, dates, banana, and water – using the AUTO BLEND setting and the result was very good. It was very smooth with no bits of spinach or chunks of fruit. There were some small date particles, but we’ve never seen perfectly-blended dates except in a Vitamix Pro. We also found it crushed ice effectively, which is a good test for small blenders. Like most high-power blenders, the Vidia was relatively loud, but no louder than others. The Vidia personal blender raises the bar for low-cost personal blenders. We found it matched or even outperformed models costing much more. It works well, is simple to use, easy to clean, looks nice (in a conservative way), and is very powerful. For 69 euros, we think it is a great value and highly recommend it.